This study examines the impact of contraceptive use on women’s educational advancement as an indicator of female empowerment, using retrospective data from the 2009 Tehran Fertility Survey. The results show that 15 per cent of married women continued their education after marriage. Also, women using modern contraceptives before a first birth were more likely to experience a 1–2-year increase in education level after marriage, controlling for other factors. Recent cohorts were more likely to continue their education after marriage, especially those who used modern vs. traditional contraceptives. The findings clearly indicate that family planning use after marriage enables women to advance their education by freeing them from reproductive activities. Canadian Studies in Population 42, 1-2 (2015): 35-52. Click here to get the Full Text of the paper. The paper describes the Brazilian Age-Structural Transition (AST) produced primarily by fertility declines (about 56% in 25 years). Slightly ahead of most of the Latin America countries, Brazil entered a stage in which strong, mostly positive, age-structural effects have been obtained. Some improvements relating to health, nutrition and education among children and youngsters, for example, were achieved in part because of the positive impacts on policy of the AST. Among the working-age population the mature population (aged 25 to 64), that usually has high activity rates and comprises the majority of taxpayers, will increase in relative and absolute terms while the junior segment (aged 15 to 24)–a proxy of those entering for the first time into the labour force–will probably have negative growth rates. Thus, the intraworking-age ratio (ratio of the junior labour force to the mature labour force, an indicator of pressure for new employments) has a downwards trend in Brazil. Different growth rates within the working-age population are therefore a new demographic “window of opportunity”. This bonus, however, can only be exploited if full employment and higher productivity are pursued. As a necessary, although not sufficient, condition to achieve social, economic and intergenerational balances, labour-force skills should be at their highest levels. For this reason, all opportunities to become skilled should be given to the potential workforce. On the other hand, due to the AST, new challenges emerge for Brazilian society. The demographic transition and its related effects of population growth, fertility decline and ageing populations are fraught with problems and controversy. When discussed in relation to the global south and the modern project of development, the questions and answers become more problematic. Population and Development expertly guides the reader through the demographic transition's origins in the Enlightenment and Europe, through to the rest of the world. Whilst the phenomenon continues to cause unsustainable population growth with disastrous economic and environmental implications, the author examines how its processes have underlain previous periods of sustained economic growth; helped to liberate women from the domestic domain; and contributed greatly to the rise of modern democracy. This accessible and expert analysis will enable any student or expert in development studies to understand complex and vital demographic theory. This is a book about the central role of the demographic transition in the creation of the modern world. It argues that you cannot understand the modern process of ‘development’ unless you put the demographic transition centre-stage. The great declines in human mortality and fertility that define the transition, plus the major changes in population size and structure that result from these declines, all have immense implications for the past, present and future of the world. Contemporary social transformations have left individuals in the two ways of freedom in and uncertainty in their choices. Today, childbearing is accompanied by a lot of such contradictions. The purpose of this study is to investigate the role of these transformations and the risks in the childbearing decision of couples in Rasht, with an emphasis on the theory of Ulrich Beck and Elizabeth Beck-Gransheim. The method of this research was survey and the data were collected using a researcher-made questionnaire. The statistical population consisted of all 25-49 years old couples in Rasht. Using stratified sampling method, 383 families were selected as the sample of the study. 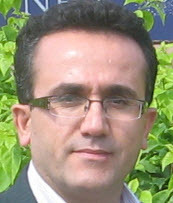 The findings show that among the women, the variables of decline of traditional values, freedom in choice, education and age at marriage, and among men in addition to these variables, the variable of individuality also contributed to their childbearing and reduced the probability of childbearing. Finally, despite the fact that people face various risks and issues, they are still giving birth to children because of their love in having child. However, in the two ways of childbearing risks and interest in the child, they choose the third route of giving birth to fewer children. 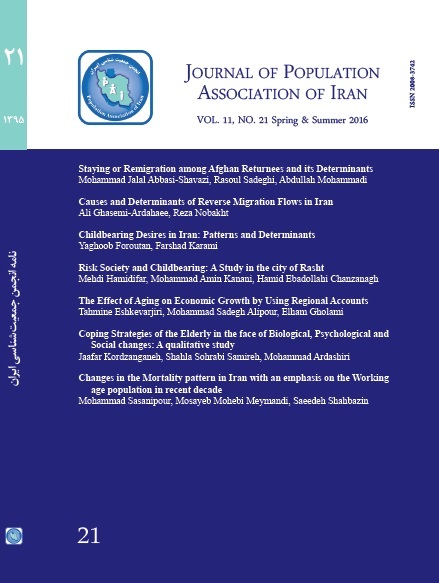 Journal of Population Association of Iran, 2018, 11(21): 102-136. Click here to get the paper.